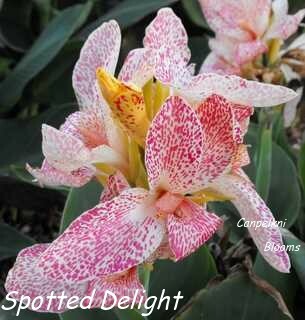 Canna Spotted Delight is an impressive little canna that is very heavily splotched and striped with dark rose pink colored markings that are evenly distributed over the whole of the flower including the stamen. 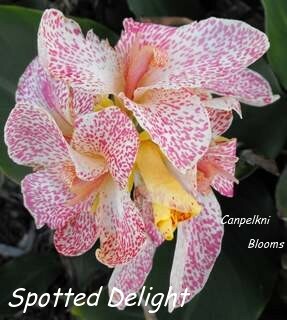 The flower buds are yellow upon opening, in an exposed sunny spot they quickly progress through to white and the pink splotches on the older blooms holds its color very well. I used to grow this is a part shaded spot along side taller cannas, however in 2009 I moved into full sun position and I have been very impressed with the results. I found Spotted Delight holds the pink color very well and the flowers last better than I thought they would, this little gem of a canna performs exceptional well through Victoria's hot dry harsh summers. 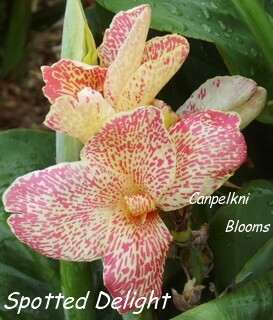 Here she is growing amongst other taller varieties; her canna flowers retain much of the cream coloring in a shady spot. 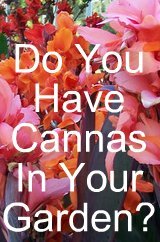 This canna is one of the more recent new cannas in Australia it was raised in 2006 by a friend Raimunda who resides in Queensland. 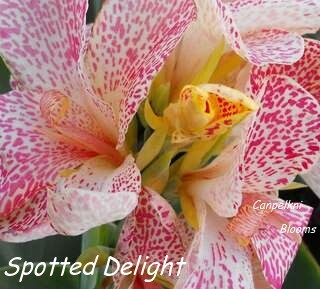 The leaves on Spotted Delight are green with a clear colored margin, just like most of the other heavily spotted cannas. The rhizomes it produces are what I class as quite small, they are not broad and chunky like some other varieties, the rhizome divisions are clumped tightly with new side shoots. A short growing garden plant that reaches just less than 80 centimeters tall. This height is measured from the ground to the top of the flowers.